This recipe first appeared in the February 2012 newsletter. If you’d like to receive a new recipe and informative health ideas in your mailbox every month sign up for the free newsletter. This is a raw foods classic from the ’70’s. Even if you’re not a retro fan, such fruity goodness is hard to not enjoy. Soak oats and dried fruit in coconut milk and a little water, for about half an hour until softened. Combine with remaining ingredients and blend in a food processor. Grease a pie dish (I used a 25 cm flan dish) with coconut oil. Push the rather sticky base into the bottom of the pan. It seems too little but will make it to the outer reaches with gentle coaxing. Rest it in freezer for 15 minutes. Blend ingredients in food processor and spoon onto the base. Refrigerate til ready to serve. Before serving decorate with fresh fruit. 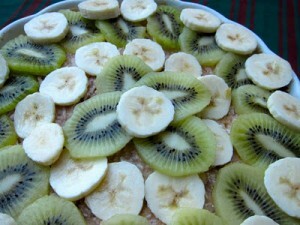 I used slices of kiwi and banana but any fruit will do such as fresh berries or orange segments. * leftover coconut milk can be frozen and used later.